A current and persistent sign of the times of another kind. For those who prefer to download and read a timetable, this Issue PDF's of all local routes from today are run, again, for you to 'save as' below. There are clear indications a shift towards ‘on demand’ services by the NSW Government is occurring where commuters may be finding a gap or lack of service. This should be taken as an opportunity, where parents are concerned about the shortfall or loss of a safe service for younger members of the family travelling home late at night, especially for those who live west of Dee Why or north of Mona Vale and find less is the new more, to commence a conversation among themselves and then present such 'on demand' options to meet that shortfall to those that have been elected to represent them. Although younger commuters are said to be in favour of the B-Line their parents have pointed out this still won’t meet the needs of a younger generation and will reduce the capacity for them to travel home safely as if they live north of Dee Why they’re stranded just after Pumpkin Time – 12 a.m. – Midnight. Other critics cite the new timetables either ensure old services cease to exist at all, creating further travel time for commuters who must now walk to a further away bus stop to catch a bus so they may alight, wait, and catch another bus or a what is commonly referred to as ‘milk runs’; that is, catch the bus and settle in for a tour ‘de everything’ through back streets as you wend slowly towards your destination. One lady, encountered on the early morning dog walk, stated the old Palm Beach to Wynyard service took only just over an hour – not the hour and 45 minutes, without having to change buses, now slated to commence this Sunday, November 26th, 2017. Of course, you must bear in mind there were less people and less traffic then. It remains to be seen if all this new infrastructure will make smoother and faster the travel commute of a much larger population. As the NSW Government's Transport for NSW announced on Thursday, November 23rd 'On demand transport for Regional NSW', an EOI, commencing a conversation to establish a service that meets those gaps, just a little further north or west, or where a service has been terminated, is not pure realm of fantasy stuff. Residents are reminded by this week's launch that feedback on the B-Line plan/proposal for Newport closes December 1st, 2017. 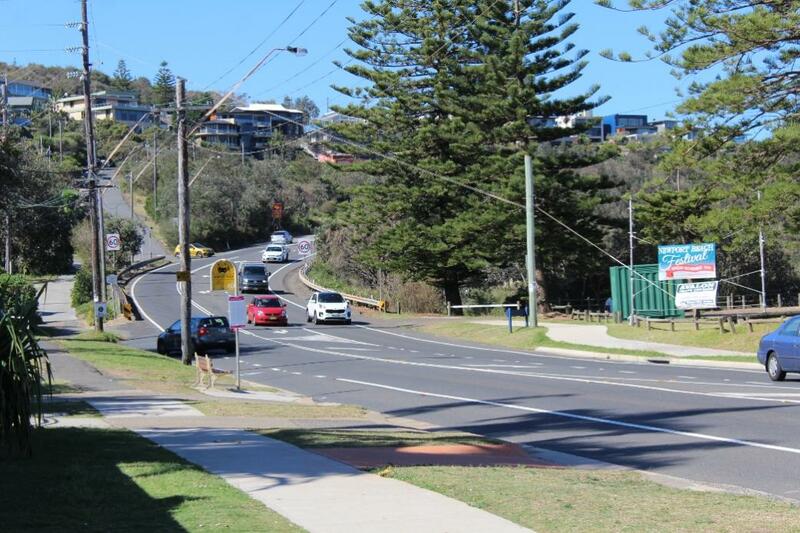 Transport for NSW want your feedback on the proposal to construct a roundabout on the corner of Neptune and Barrenjoey Roads to turn the buses around. If you’re vehemently opposed to such a notion, perhaps the ‘on demand’ vision here needs to be expanded to minibuses instead of snazzy little cars to meet the demand; (supply=demand) and perhaps knock any notion of a B-Line to Newport being then needed/wanted/required. 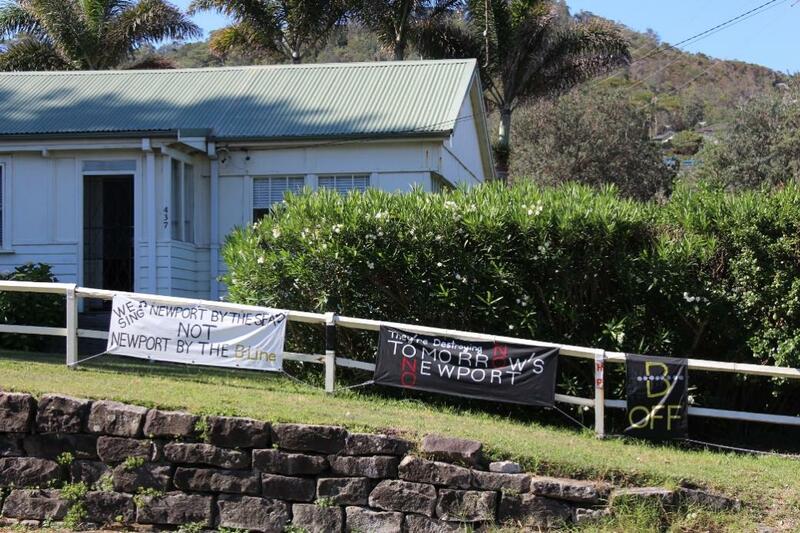 There must be a way to keep it peaceful, keep Newport green with a lively village atmosphere along the shopfronts and space enough for people to have a conversation without being drowned out by mass-bus traffic noise should residents wishes to keep what many associate with Pittwater in Pittwater persist. While on that roundabout on that corner, other readers, who also get to be heard, have pointed out that Neptune/Barrenjoey corner, as well as the entrance-exit to Porter’s during the players season, are the sites of accidents and frequent near misses – with three in just the past two days on the corner of Neptune. Study after study cites the reduction of accidents in areas were these recur after a roundabout is installed. Does that idea need to shift a tad further north and alleviate what occurs at both those sites so that it may not wreck the view, not kill any Norfolk pines, not excise anyone’s front yard or house and not create a bottleneck? – if done wrong, can the community stand another bottleneck alike that at Kamikazee? – also introduced to save lives through stopping accidents at what was once ‘Five Ways’. Is that an option and discussion that should have taken place a long time ago anyway? The B-Line to Newport proposal also begs that question: Do you want the encroachment of what is clearly inferred through allowing the creep towards Newport of lots of shiny new yellow buses to mean, as has been stated, and recently reiterated through the GSC’s Plans for Mona Vale (Mona Vale Place Plan Mrk. II), as being qualification for ‘urban activation’ for Newport to be up for discussion too? If it’s not yet transparent enough, since the B-Line is touted as qualification for Mona Vale's 'urban activation', why not ask ‘why not’? Whatever your thoughts, your feedback will help TfNSW understand what is important to the community, and help them prepare a Review of Environmental Factors that will be released for consultation early next year. Other questions/continued conversation could be referred to those in charge of those 'departments'; your local members. Feedback should be sent by 5pm Friday 1 December 2017. Or download and ‘save as’ from PDF’s below. New timetables will be introduced from 26 November, including almost 7,000 extra weekly trips across the bus network. New services will be added to routes across Western Sydney, the Eastern Suburbs, Inner West, Lower North Shore and Northern Suburbs, Illawarra and Central Coast. In addition, there will be changes to bus services in Pittwater and the Northern Beaches, in conjunction with the new B-Line. Search for your bus route to see your new timetable - here. We've also loaded these PDF's below for you to keep a copy handy - simply click on the file relative to you and 'save as' on your own PC or Device. These timetables commence November 26th. New route 199 will operate as a full time, all-stops service between Palm Beach and Manly via Avalon, Newport shops, Newport loop, Mona Vale, Narrabeen, Collaroy, Dee Why and Warringah Mall (Pittwater Road). Route 199 will provide connections to B-line services at Newport. Route L90 will continue to operate during weekday off-peak (9:00am-3:00pm) and weekends (7:00am-10:00pm), with a service frequency of 60 minutes. For travel to the City outside of these times, catch route 199 and connect to B-Line services at Newport. Route 199 will operate as a full time, all-stops service between Palm Beach and Manly via Avalon, Newport shops, Newport loop, Mona Vale, Narrabeen, Collaroy, Dee Why and Warringah Mall (Pittwater Road). Route E88 will have a modified stopping pattern, with services operating all stops to Narrabeen then stopping only at Neutral Bay Junction and the City. Additional route E88 services will be provided. Route L90 will continue to operate during the weekday off-peak (9:00am-3:00pm) and weekends (7:00am-10:00pm), with a service frequency of 60 minutes. For travel to the City outside of these times, catch route 199 and connect to B-Line services at Newport. Routes 191 and 192 will now operate every 30 minutes across the day. Route E89 will have a modified stopping pattern, with services operating all stops to Narrabeen then stopping only at Neutral Bay Junction and the City. New B-Line services will operate between Newport and the City, providing frequent services all day, seven days a week, stopping only at Newport, Mona Vale, Warriewood, Narrabeen, Collaroy, Dee Why, Brookvale, Manly Vale, Spit Junction, Neutral Bay Junction and the City. New route E54 will operate between Mona Vale and Milsons Point via North Sydney, providing frequent services during weekday peak periods, stopping at Mona Vale, Warriewood, Narrabeen, Collaroy, Dee Why, Brookvale, Manly Vale, Spit Junction, Neutral Bay Junction, and then all stops to North Sydney and Milsons Point. Route 155 will be modified to operate between Bayview Garden Village, Mona Vale and Narrabeen only, and no longer operate to Manly. For travel to Dee Why, Warringah Mall or Manly, connect to the all-stops route 199 at Mona Vale or Narrabeen. Route 156 will be modified to operate between McCarrs Creek, Church Point and Mona Vale only. For all-stops travel to Dee Why, Warringah Mall or Manly, use route 199. Route L60 to Chatswood will be renumbered to route E60, and will be altered to operate via Warringah Road through Narraweena and Beacon Hill. Route E60 will also be altered to operate via Boundary Road and Archer Street in Chatswood. Additional services will be provided. Route 182 will be modified to operate via Samuel Street, Parkland Road and Waratah Street, replacing routes L85/185 in this area. Route 185 will be modified to operate between Mona Vale and Warringah Mall (Pittwater Road) only. Route 185 in the Samuel Street, Parkland Road and Waratah Street area will be replaced by route 182 which will be modified to operate in this area. Route L85 will no longer operate, replaced by all-stops route 185 to Warringah Mall (Pittwater Road). For travel to the City connect with B-line services at Narrabeen. Route L90 will continue to operate during the weekday off-peak (9:00am-3:00pm) and weekends (7:00am-10:00pm), with a service frequency of 60 minutes. For travel to the City outside of these times, catch new B-line services or routes E88 or E89. Routes 184, L84, L85, E86, 187, E87, L87 and L88 will no longer operate, replaced by B-line services and routes E54 and 199. Route 156 will be modified to operate between McCarrs Creek and Mona Vale, with increased frequencies across the day. For travel to Dee Why, Warringah Mall or Manly, connect to all-stops route 199 at Mona Vale. Route E86 will no longer operate. For travel to the City, use route 156 and connect to B-Line services at Mona Vale. Route 155 will be modified to operate between Bayview Garden Village and Narrabeen only via Narrabeen Peninsula and no longer operate to Manly. For travel to Dee Why, Warringah Mall or Manly, connect to all-stops route 199 at Mona Vale or Narrabeen. Route E85 will have a modified stopping pattern, with services operating all stops to Dee Why, then stopping only at Warringah Mall (Pittwater Road), Neutral Bay Junction and the City. Additional services will be provided. Route 185 will be modified to operate between Mona Vale and Warringah Mall (Pittwater Road). For travel to the City, connect to B-Line services at any B-Line bus stop between Mona Vale and Warringah Mall (Pittwater Road). Route L85 will no longer operate, replaced by route 185. For travel to the City, connect to B-line services at Narrabeen. Route E83 will have a modified stopping pattern, with services operating all stops to Dee Why, then stopping only at Warringah Mall (Pittwater Road), Neutral Bay Junction and the City. Additional route E83 services will be provided. On Demand services for the Northern Beaches region are operated by Keolis Downer and begin from Sunday 26 November 2017. This service runs from Palm Beach, south to North Narrabeen and west to Chiltern Road to nearby transport hubs, including new B-Line bus stops from late 2017. You can book this service at keoride.com.au or by calling 1800 KEO RIDE (1800 536 7433). You will receive a booking confirmation and an estimated pick-up and drop-off time at your chosen location. Bookings are subject to availability. A one-way trip will cost $3.10. Half price fares will be available for concession card holders, including pensioners, seniors, students and apprentices. What happens if I just want to catch my bus and not use on demand? The Northern Beaches on demand pilot will operate in addition to existing bus services that currently service the area. What options do I have pay to for my trip? The first journey will require a little bit of time to register a profile. Once this initial registration has taken place all subsequent bookings will be far more efficient as the system will be able to link your trip with your profile. Payments can only be made by credit card. Opal cards and cash cannot be used for the trials and payment directly to the driver is not accepted. Can I make multiple travel bookings? Yes the booking system allows you to book multiple trips at once so that you can plan ahead a few weeks in advance. Your payments will be collected at the time of your booking so please remember to cancel or change bookings made in advance if your circumstances change. What happens once the trial is finished? Transport for NSW is undertaking a number of on demand trials across NSW and will evaluate the various trials once they are complete. The Northern Beaches On Demand service area is split into 2 zones. Zone 1 includes Palm Beach, Whale Beach, Clareville, Avalon Beach, Newport, Bayview and Mona Vale. Zone 2 includes Ingleside, Warriewood and North Narrabeen. The on demand transport trials are a great way for us to learn more about you. On Demand services for Manly area are operated by Transdev (http://www.transdevnsw.com.au/)and began on Monday 20 November 2017. You can book a service at ride-plus.com.au. Bookings can be made from 1 week up to 1 hour prior to your trip. Bookings are subject to availability. A one-way trip will cost $3.10. There are no concession fares for this service. Ride Plus is being piloted for 6 months in Manly and the Eastern Suburbs from November 20, 2017 as part of the NSW Government’s Future Transport program, with a possible extension up to 2 years. NextThere displays when the next public transport services are due to depart from where you currently are. It can show you which services will get you to your chosen destination most efficiently. • Displays your public transport options on an easy-to-read map. • School bus information available. • Shows available passenger space on the next bus service. • Check timetables and departure times for all nearby services. • Favourite specific routes and services. • Set reminders and get notifications about changes to services. • Display features big text and bright colours. Route L90 will continue to operate during weekday off-peak (9:00am-3:00pm) and weekends (7:00am-10:00pm), with a service frequency of 60 minutes. For travel to the City outside of these times, catch route 199 and connect to B-Line services at Newport, or routes E88 or E89 at any bus stop along Barrenjoey Road. Routes 187 and L87 will no longer operate. For travel to North Sydney and Milsons Point, use B-line services or route 199 to Mona Vale, and connect to frequent route E54 services to North Sydney and Milsons Point during weekday peak periods. Route E87 will no longer operate. For travel to the City, catch B-Line services at Newport, or routes E88 or E89 at any bus stop along Barrenjoey Road. Services via the Newport Loop will be provided by routes 199 and L90. Route 185 will be modified to operate between Mona Vale and Warringah Mall (Pittwater Road). Route 155 and 156 would no longer operate in the Collaroy area. For travel to Mona Vale, Dee Why, Warringah Mall or Manly use route 199. Routes E88 and E89 will no longer stop at Collaroy. For travel to Neutral Bay or the City use B-Line services. Route L90 will continue to operate during the weekday off-peak (9:00am-3:00pm) and weekends (7:00am-10:00pm), with a service frequency of 60 minutes. For travel to the City during weekday peak periods, catch B-Line services. Routes 183, 184, L84, L85, E86, 187, E87, L87 and L88 will no longer operate, replaced by B-Line services and routes E54 and 199. Route L80 to the City will be renumbered to route E80 and will operate all stops to Dee Why, then stopping only at Warringah Mall (Pittwater Road), Neutral Bay Junction and the City. Additional route E80 services will be provided. There will be no change to route 180. New route 146 will operate between Wheeler Heights and Manly via Dee Why and Warringah Mall (Pittwater Road), replacing route 179 between Wheeler Heights and Warringah Mall. Route 153 will no longer operate. Alternative services to Dee Why and Warringah Mall will be provided by routes 146 and 178. Route 179 will no longer operate. New route 146 will replace route 179 between Wheeler Heights and Warringah Mall. For travel to the City, transfer to B-line services at Warringah Mall. There will be no changes to routes E78, 178 and E79. New route 146 will operate between Wheeler Heights and Manly via Dee Why and Warringah Mall (Pittwater Road). Route L60 will be renumbered to route E60, and will be altered to operate via Warringah Road through Narraweena and Beacon Hill. Route E60 will also be altered to operate via Boundary Road and Archer Street in Chatswood. Additional services will be provided. Route E69 will have a modified stopping pattern, with services operating all stops to Avona Crescent, Seaforth then stopping only at Cremorne Junction, Neutral Bay (Watson Street) and the City. Additional route E69 services will be provided. There will be no changes to routes 136, 169, 173, 178, E78 and E79. to North Sydney and Milsons Point. Routes 155 and 156 will no longer operate in the Dee Why area. For travel to Mona Vale, use route 199 and for travel to Warringah Mall and Manly use routes 146, 169 or 199. Route 179 will no longer operate. For all-stops services to the City via Balgowlah, use routes 178 and 180. Route L90 will continue to operate during the weekday off-peak (9:00am-3:00pm) and weekends (7:00am- 10:00pm), with a service frequency of 60 minutes. For travel to the City during weekday peak periods, catch B-Line services. Routes L78, 183, 184, L84, L85, 187, E86, E87, L87 and L88 will no longer operate, replaced by B-Line services and routes E54 and 199. There will be no changes to routes 136, 158, 159, 169, 178, 180, E76, E77, E78 and E79. New route E75 will operate between Warringah Mall (Pittwater Road) and the City, via Condamine Street, Balgowlah Shops and Sydney Road. The service will operate all stops to Spit Junction then stopping only at Neutral Bay Junction and the City. Route E75 services will operate during weekday peak periods. There will be no changes to routes 132, 135, 142, 178, 180, E66, E76, E77, E78 and E79. Route 145 will be modified, no longer operating via North Seaforth. Route 168 will be modified to operate to Milsons Point only. Services to the City will continue to be provided by route E68. Route E41 will no longer operate. Services to and from Manly to connect with the Manly Ferry will be provided by routes 132, 143 and 144. Route E68 will have a modified stopping pattern, with services operating all stops to Spit Junction, and then stopping only at Neutral Bay Junction and the City. Additional route E68 services will be provided. Route E69 will have a modified stopping pattern, with services operating all stops to Avona Crescent, Seaforth then stopping only at Cremorne Junction, Watson Street and the City. Additional route E69 services will be provided. There will be no changes to routes 143, 144, 169, E69, 173, 178, 180 and 248. New route 199 will operate between Manly and Palm Beach via Warringah Mall (Pittwater Road) and Dee Why. New route 146 will operate between Manly and Wheeler Heights via Warringah Mall (Pittwater Road) and Dee Why. Route 130 (Pumpkin Bus) will no longer operate. Late night services from Manly on Friday and Saturday nights will be provided by additional services on routes 136, 142 and 169. Route 131 will no longer operate. Evening services to Balgowlah Heights, Seaforth and North Balgowlah will be provided by route 132. Route E36 will no longer operate. Services to and from Manly to connect with the Manly Ferry will be provided by routes 136 and 139. Route 135 will be extended to operate to and from North Fort Museum on all trips during the weekday off peak and weekend. Routes 155 and 156 will no longer operate to and from Manly. These routes will be replaced by routes 146, 169 and 199. Route 140 will no longer operate. Alternative travel between Manly and Macquarie Park is available by routes 143 and 144 to St Leonards, and connecting to other buses or Sydney Trains services. Route E70 will have a modified stopping pattern, with services operating all stops to Avona Crescent, Seaforth then stopping only at Cremorne Junction, Watson Street and the City. Route E71 will have a modified stopping pattern, with services operating all stops to Spit Junction then stopping only at Neutral Bay Junction and the City. Additional route E71 services will be provided. Route E50 will have a modified stopping pattern, with services operating all stops to Seaforth then stopping only at Watson Street and then all stops from Miller Street to Milsons Point. There will be no changes to routes 132, 136, 139, 142, 143, 144, 158, 159 and 169. Route 131 will no longer operate. Evening services to and from Manly will be provided by route 132. Route 171 will no longer operate. Additional services will be provided on route E71. Route 185 will no longer operate in the Balgowlah area. For travel to the City, use routes 178 and 180. Additional route E66 services will be provided. There will be no changes to route 142. New route E54 will operate between Milsons Point and Mona Vale, stopping at all stops to Falcon Street, then stopping at Neutral Bay Junction, Spit Junction, Manly Vale, Brookvale, Dee why, Collaroy, Narrabeen, Warriewood and Mona Vale. Routes 175, 183, 187, L84, L78 and L87 will no longer operate. Alternative services will be provided by new route E54. There will be no changes to routes 168, 173, 227, 228, 229 and 230. Route 140 will no longer operate. Alternative travel between Mosman and Macquarie Park is available by routes 143 and 144 to St Leonards, and connecting to other buses or Sydney Trains services. Route 236 will be modified to operate via Punch Street, Mosman. Routes E70, E83 and E85 will no longer stop at Spit Junction. Routes E68, E71 and E75 will now stop at Spit Junction. There will be no changes to routes M30, 143, 144, 151, 169, 173, 178, 180, 188, 227, 228, 229, 230, 244, 245, 246, 247, 248, 249 and 257. Route 140 will no longer operate. Alternative travel between Cremorne and Macquarie Park is available by routes 143 and 144 to St Leonards, and connecting to other buses or Sydney Trains services. Routes E68 and E71 will no longer stop at Cremorne Junction. There will be no changes to routes M30, 143, 144, 151, E65, E66, E69, 169, E70, 173, E76, E77, E78, 178, E79, 180, 188, 227, 228, 229, 230, 244, 245, 246, 247, 248, 249 and 257. Route 140 will no longer operate. Alternative travel between Neutral Bay and Macquarie Park is available by routes 143 and 144 to St Leonards, and connecting to other buses or Sydney Trains services. Routes E68, E71 and E75 will now stop at Neutral Bay Junction. There will be no changes to routes M30, 143, 144, 151, 169, 173, 178, 180, E83, E85, E88, 188, 227, 228, 229, 230, 243, 244, 245, 246, 247, 248, 249 and 257. Routes E68 and E71 will no longer stop at Watson Street. There will be no changes to routes M30, 143, 144, 151, E65, E66, E69, 169, E70, 173, E76, E77, E78, 178, E79, 180, 188, 227, 228, 229, 230, 243, 244, 245, 246, 247, 248, 249 and 257. On Demand transport is coming to the regions as the NSW Government launches expressions of interest for the first set of public transport trials to bring transport directly to you. Minister for Transport and Infrastructure Andrew Constance said On Demand will play a big part in the future of public transport and it was critical to bring that future to rural and regional NSW. “Instead of relying on timetables, On Demand brings transport to you – when you want, and where you want,” Mr Constance said. Deputy Premier John Barilaro said that while the NSW Government is trialling On Demand services across Sydney, this call for expressions of interest is focused specifically on rural and regional NSW. Mr Barilaro said the trials could include connecting services to existing transport hubs, schools, universities, hospitals or places of interest. “This trial is all about putting the transport customer at the centre of the system,” Mr Barilaro said. “We want to provide a new model of transport for rural and regional NSW that satisfies the individual and unique needs of local towns and rural cities. “I really would like to see regional companies putting their hand up for this trial, because often its country businesses who know best how to deliver for country people. “Not only do we want to hear from local innovators, we also want to hear from rural and regional bus, community transport and taxi operators, those who know the local area and understand what local transport customers need. Expressions of interest for the rural and regional On Demand transport trial will be released on the NSW e-tendering website shortly, with responses from industry due in February 2018. Following an evaluation period, all pilots are expected to be operational by the end of 2018. The Transport for NSW team will be on the road travelling through rural and regional areas of NSW in late 2017. Details of the briefing locations and dates will be published in the coming weeks. 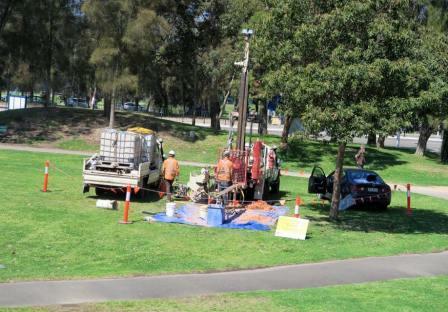 Investigative Drilling is currently being undertaken in Beeby Park Mona Vale and Village Park Mona Vale by Transport NSW. They are looking at potential sites to build the bus rapid transit interchange. A number of sights are being looked at around the MV CBD. 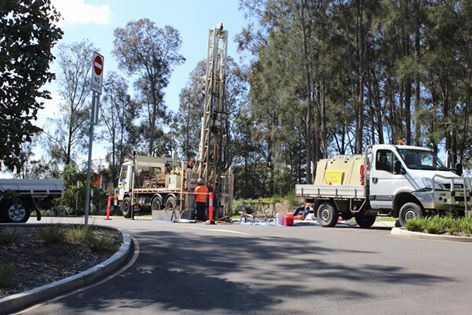 MVRA contacted Transport NSW this week and found out there are 5-6 sites under investigation around Mona Vale. The state owned Bus depot in Darley Street is also being looked at as a potential transport hub. This is a site that the Mona Vale Residents Association think should be seriously considered as it will not have an impact on green open space and will be far better for traffic movements. We are now seeking a meeting regarding this matter with Transport NSW. It is disappointing that communication with the community had completely been ignored.